Hear perspectives on Autism ranging from Personal to Professional. lives in Portland, Oregon, where he works as a speaker and advocate for children and adults on the Autism Spectrum, and also works as a musician. After suffering years of bullying and abuse in school he was finally diagnosed with Aspergers as a freshman in high school. 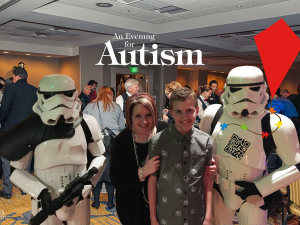 In 2008 Jonathan became the first person on the Autism Spectrum to serve on the Autism Society of Oregon’s Board of Directors and he is involved with many other Autism organizations in the NorthWest. Jonathan offers a variety of tools, strategies, and presentations to assist individuals on the autism spectrum, their families, and the professionals who work with them. Jonathan’s theme is: Nobody but you can decide whether or not you will be successful. received his master’s degree in 1975 from Idaho State University, and a PhD from Wichita State University in 1997. He has worked in schools and in private practice, and was an assistant professor at OHSU where he continues to hold a clinical assistant professorship. Dr. Buckendorf now works with his son and daughter-in-law in private practice at Buckendorf and Associates. His interests are in pediatric speech and language disabilities including autism, language disorders, phonological disorders, cranio-facial disorders, and fluency disorders. Dr. Buckendorf presents nationally and internationally on the topic of child directed interventions for children with Autism Spectrum Disorders, edited the text Autism: A Guide for Educators, Clinicians, and Parents (2008, Thinking Publications), and has co-authored several book chapters on Speech-Language pathology topics. Jonathan Chase is an Autistic adult in his late 20’s along with Dr. Bob Buckendorf who brings more then 30 years of engagement based play principles will be speaking at ARRO. Jonathan will share his early years experience from an Autistic perspective and will answer questions from attendees. Bob will share techniques that he uses in his private practice to increase engagement but both of these speakers come from a strong principle of acceptance and respect for the person. Please RSVP to this event with a suggested donation of $5.00 to help ARRO cover the cost of the event. This event will be limited to 50 persons so be sure to RSVP early. This entry was posted in Autism Awareness, Calendar, Lecture, News and Updates, Westside Family and Community Center. Bookmark the permalink.